1986; 217 Pages. Genre : Camedic Fantasy. Overall Rating : B. As noted here, The Light Fantastic is the conclusion to the story started in The Color Of Magic. 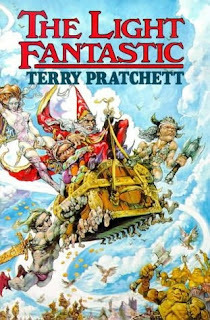 That fount of all wisdom (Wikipedia), assures me this won't happen again - all other Discworld books are self-contained. There's just one tale here; not four somewhat unconnected ones like in TCOM. Pratchett apparently took some pains to refine his style for the series, and this is an improvement, even though it resulted in a 3-year wait for TLF to be published. Once again, there's a lovable cast of characters. Rincewind and Twoflower are center-stage of course, and the sickle-wielding Death and the omnivorous Luggage are back as well. TLF introduces Cohen The Barbarian, who reportedly will show up in a number of subsequent books. He's 87 years old, doddering, with matchstick legs and varicose veins. And in desperate need of dentures. Eat your heart out, Arnold. The storyline wraps up nicely, with our inept duo saving the cosmos. As always, there are some deeper, more serious themes interwoven in the Discworld silliness. Here, Pratchett takes on Doomsday Zealots and Blind Religious Fervor. Intelligent Design freaks will probably not like TLF. You can find everything in Discworld books - philosophy, romance, and for highbrows like me, gut-groaning puns. We'll close with an excerpt in each category. "I said : what is it that a man may call the greatest things in life?" The warriors leaned closer. This should be worth hearing. The guest thought long and hard and then said, with deliberation : "Hot water, good dentishtry and shoft lavatory paper." The old woman across the fire shrugged and pulled a pack of greasy cards from some unseen pocket. Despite the deep frost outside, the atmosphere inside the yurt was like a blacksmith's armpit and the wizard was already sweating heavily. Horse dung made a good fuel, but the Horse People had a lot to learn about air conditioning, starting with what it meant. "What's neck romance?" she whispered. "Necromancy. Talking to the dead," he explained. "Oh," she said, vaguely disappointed. "Yes, yes," said Bethan, sitting down glumly. ... "Rincewind, all the shops have been smashed open; there was a whole bunch of people across the street helping themselves to musical instruments; can you believe that?" "Yeah," said Rincewind, picking up a knife and testing its blade thoughtfully. "Luters, I expect." Even Milton can't write stuff like that. The Light Fantastic is, as usual, highly recommended, but only after first reading The Color Of Magic. Too funny! These are among some of the greatest things in life and I'm thankful for them too. Sounds like a highly entertaining series and a great review! I haven't read these earlier novels, but Rincewind was back in the book "Interesting Times". While I found him humorous, and the story quite enjoyable overall, I wasn't as fond of the luggage, and found Cohen and his horde overly repetitive. At first I found them funny, but it quickly faded because they are pretty one-dimensional characters. It looks to me like you're to the point where you've read about as many Pratchett novels as I have. It's a very prestigious distinction, I must say. Jolly well done! the first two books i read in this series (Guards! Guards! and Thud!) both featured Sam Vimes and the City Watch. i personally find him (and the 6-foot dwarf "Carrot") more engaging than Rincewind. and i still haven't run across Granny Weatherwax, whom i gather is a major character. but there's still 4-5 Discworld books in my TBR stack, and the local library has at least a dozen more. i suspect there will be a lot of Pratchett in my 2009 6-Squared list.